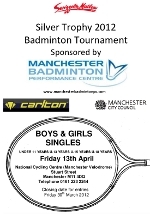 The tournament will be taking place on Friday 13th April 2012 (during the Easter holidays) starting from 9:30am at the National Cycling Centre (Manchester Velodrome), which has plenty of courts, seating and a cafe. The entry fee is only £3 per player with all players treated to plenty of Swizzles Matlow sweets. The entry form can be downloaded here. The deadline for entries is Friday 30th March 2012.